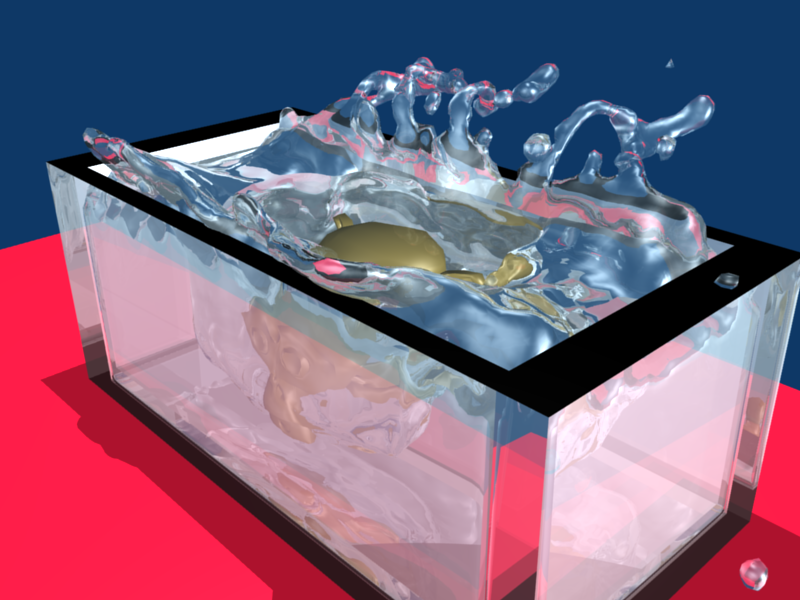 So, with water simulations in Blender, the resolution of the water particles can be set. Basically, you are telling the simulation engine how big to consider the particles of water to be. This can have extremely dramatic results. Let’s take the tank of water I rendered yesterday. This time I’m at a more exciting point in the animation, frame 104. First, here is the animation with a resolution of 50. This takes up about 3 MB on my computer. As you can see, the water has been calculated as one giant blob. It doesn’t look particularly impressive and it seems like a lot of water is being displaced relative to the size of the object being dropped in. This is because the sim is effectively calculating the water as if it were a few large particles. Now, let’s bump up the resolution to 100. This takes considerably longer to calculate and takes up 50 MB on my computer. Much better, right? It’s still a bit “blob-y”, but you can see some bits of water are breaking off, that is, they are small enough to be separated from the rest of the water. There isn’t as much water being displaced either as it’s better able to calculate the effect the object’s shape on smaller particles of water. It’s looking a bit more realistic. Now, let’s check out a resolution of 200. This takes about 15-20 minutes to calculate with the amount of RAM I have and takes up 250 MB on my computer. Now this is getting much, much closer to the realm of realism, right? You see the individual sprays of water and it’s no longer acting so much like a blob. This comes at the sacrifice of simulation time up front, but once you have it looking the way you want, you just bake it and then it no longer slows things down too much. There IS a tradeoff in that you can’t see the final way the water will behave without rendering unless you want to take a huge penalty in terms of the program slowing down. That is, while you’re working, you see a preview version of the water sim (typically at a resolution of 25) in order to keep all the individual particles and polygons from slowing down your computer. At least, it’s an issue with my computer – yours may be sufficiently fast/RAM-equipped. Hope that was informative and looks neat to you! Why do fluid simulations fascinate me so much? And now it’s sapping energy from monkey brain and using it to open a PORTAL! Quick, draw a pentagram around it before something more powerful than you can control slips through! Wait until you see the final animation! Predicted by DrQueue to be ready sometime around midnight….